In 2012, breast cancer was one in every four diagnosed cancer cases. Although breast cancer treatments are already complex as they are, they may get much more complicated in the event of pregnancy. Pregnant patients can be treated according to the standard procedure with precautions while termination of pregnancy provides no significant advantage in the outcome. Even though some threshold values have been set for radiogenic risks, fetal doses with “as low as reasonably achievable” (ALARA) principle is still a commonly accepted approach. To achieve this goal, pregnant patients who receive radiation for diagnostic or therapeutic reasons are shielded with lead aprons or specific shielding designs., While lead aprons are mostly used for shielding of photons with lesser energies (in the order of kilovolts), lead blocks with a few centimeters of thickness are used for higher energies with special designs. Breast cancer treatment includes whole breast irradiation (WBI) after surgery. Mostly preferred radiotherapy techniques for WBI are 3-dimensional conformal radiation therapy (3D CRT) and intensity-modulated radiation therapy (IMRT). While there is a common tendency to choose 3D CRT, recently, IMRT is also preferred since it provides lower complication (cardiac, lung, skin toxicities, etc.) risks and higher homogeneity index. In most of the radiotherapy clinics, it is much harder to apply special fetal dose reduction techniques for pregnant patients with malignancies due to their requirement of time and effort. 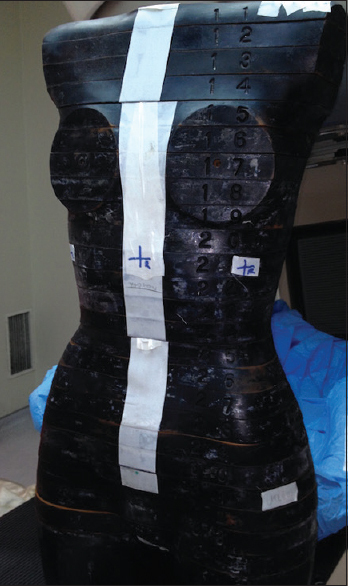 Two techniques were considered to be the most time saving and effortless for IMRT: Treatment planning systems' (TPSs) ability to estimate fetal doses and coverage of the abdomen of the pregnant patient with a standard radiological purpose lead apron. TPSs are known to be accurate inside the beam area; however, if they are able to estimate the peripheral doses accurately (i.e., fetus), there might be a possibility to modify the plan to reduce the fetal dose. Due to their various dose calculation algorithms, TPSs estimate peripheral doses only with major differences. Lead aprons are used in imaging departments; however, many radiotherapy centers may include either a planar X-ray or a tomography unit, which provides anatomical images for TPSs. In these radiological examinations, energy of the produced photon is relatively low (i.e. 60–140 keV). Therefore, it is possible to absorb most of the unintended photons (up to 95%) with a lead apron that has 0.25–0.50 mm lead equivalent shielding material. Even though breast radiotherapy uses photons with higher energies (mostly 6 MV), the lead apron is expected to absorb at least a small portion of scattered photons that have lesser energies and reduce the fetal dose. Another purpose of using a lead apron is to give a feeling of security to the pregnant patient and relieve her anxiety. Studies indicate that mothers may worry about their child/children being exposed to radiation in utero, which may cause serious side effects in the pregnancy and fetus. In this study, TPSs (anisotropic analytical algorithm [AAA] and Acuros XB algorithm) and use of a radiological purpose lead apron were investigated for IMRT plans for fetal dose reduction in pregnant patients with left breast cancer in a retrospective manner using phantom-based approach. An Alderson anthropomorphic female RANDO radiation therapy phantom (Radiology Support Devices Inc., Long Beach, CA, USA) was used to simulate a left breast cancer patient whose pregnancy period was <8 weeks. This time limitation of pregnancy was chosen due to fetus' higher radiation sensitivity and absence of volume changes in the mother's abdomen area. Phantom has several breast slices that can create various breast volumes (from 200 to 1200 ml). In this study, an average breast volume of 500 ml was chosen according to a study that was done in Turkey. 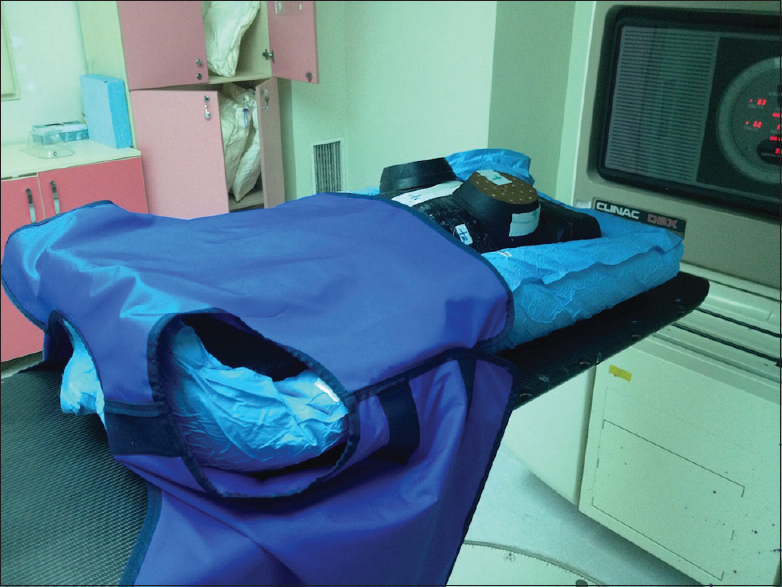 A vacuum bag was prepared for the phantom's immobilization as it is done in standard procedure of breast radiotherapy. After the preparation of phantom as shown in [Figure 1], a whole-body computed tomography (CT) image was taken (with 5-mm slice thickness) using Philips Brilliance Big Bore 4D CT scanner (Philips Medical Systems, Cleveland, OH, USA). 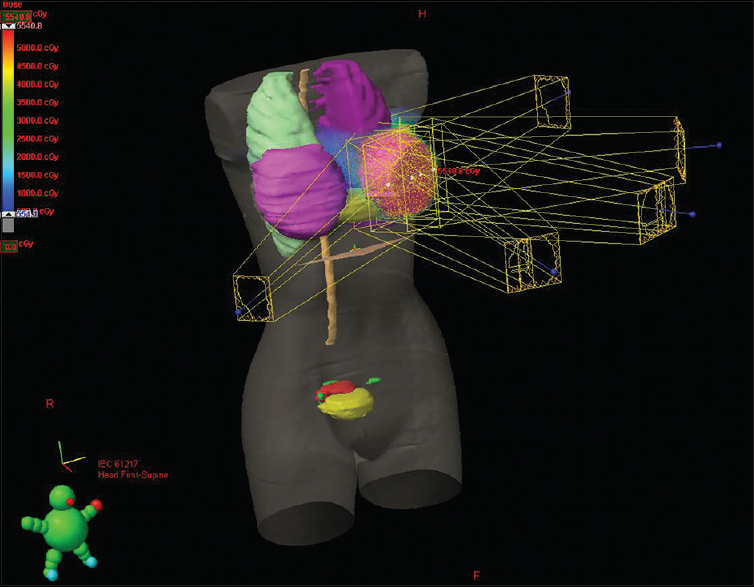 Planning target volume (PTV) and organ at risk were contoured to create treatment plans. The reason for choosing 5-mm slice thickness rather than 2–3 mm – which is commonly used – in CT imaging was the unusually larger area of simulation, which includes both breasts and uterus together. For treatment planning, two different algorithms of a commercial TPS Varian Eclipse Acuros XB version 13.0.33 (Palo Alto, California, USA) were chosen: AAA and Acuros Monte Carlo method. These methods were decided due to the TPS's capability to calculate photon interactions and estimate tissue doses. A standard IMRT treatment for a left breast cancer patient (without any boost) was planned using this TPS [Figure 2]. The plan had five fields (gantry angles: 310°, 350°, 20°, 60°, and 115°) and used dynamic (sliding window) technique. PTV was irradiated with a radiation dose of 50 Gy over 25 fractions using 6 MV X-ray photon beams [Figure 3]. A Varian 6DBX (Palo Alto, California, USA) linear accelerator was used for the irradiation. The plan fulfilled all institutional criteria. For PTV, 95% of total breast acquired dose over 45 Gy and the maximum breast dose was kept below 55 Gy. For ipsilateral lung, the volume that acquired 20 Gy was kept below 20%. Mean heart dose was kept below 5 Gy. For contralateral breast, mean dose was kept below 2 Gy and maximum dose was kept below 20 Gy. 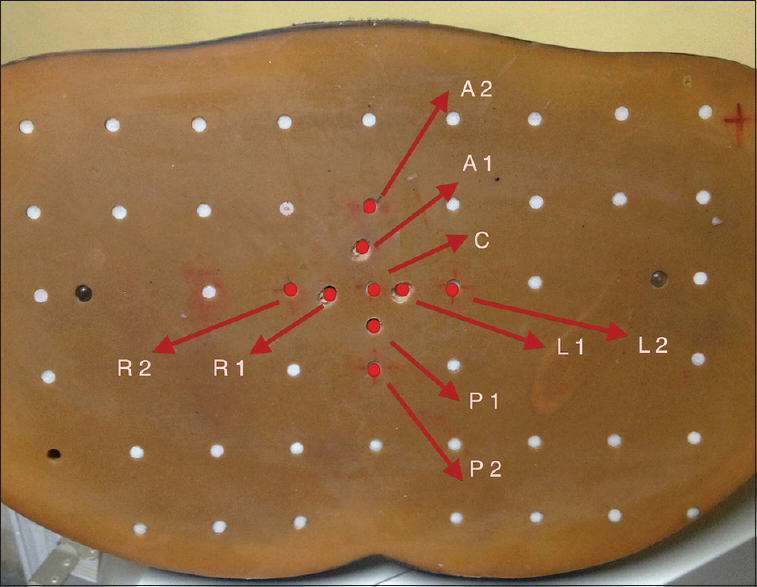 In this study, a standard lead apron with 0.5 mm frontal and 0.3 mm rear lead equivalence was used. Rear side of the lead apron covered the phantom's abdominal area from the bottom up to its supposed rib cage, protecting the whole area with a 0.3 mm lead equivalence [Figure 4]. This covering technique was chosen to prove a comfortable protection for a pregnant patient. Making the patient to wear the apron appropriately may cause severe discomfort, especially in further stages of pregnancy, thus only covering the abdominal area was envisioned in this study. Dose measurements were done with GR-200A (PTW, Physikalisch Technische Werkstätten, Freiburg, Germany) thermoluminescence dosimeters (TLDs). These TLDs are 4 mm in diameter and have a thickness of 0.8 mm. A total of 54 TLDs were used for shielded and unshielded irradiation of the phantom. The placement of TLDs over the phantom is shown in [Figure 5]. Three TLDs were irradiated for each measurement point, and the average dose of the points were calculated. While there were no significant average dose differences between the measurement points, center was chosen to be the mean dose value for each irradiation. Measurement points were chosen for a fetus whose gestational age is <8 weeks, in accordance with the data given by the study of Bradley et al. The dose response curve of TLDs was linear up to 5 Gy for 6-MV photons. All TLDs were divided into three groups for this study, according to their dose readings. The standard deviations for each group of TLDs' readings were found to be <1%. The 1-Gy dose calibration of TLDs was done in the solid water equivalent phantom with a 10 cm × 10 cm field size at a 5-cm depth and a source-axis distance of 100 cm. The TLDs were annealed in an oven up to 220°C for 15 min and cooled at room temperature for 20 min. This heating was done to initiate the thermoluminescence process and to acquire the dose measurements from the irradiated TLDs by releasing most of its electron traps. TLD values were read with a Fimel LTM Reader (Fontenay-aux-Roses, Paris, France). Comparison of the values was done using Wilcoxon signed-rank method. In this study, we compared two sets of data which have no normality and are non-parametric, and hence, this method was appropriate. The Statistical Package for Social Sciences (SPSS version 11, IBM Corporation, New York, USA) software was used for analyzing the acquired data. Statistical significance was considered as P < 0.05. AAA and Acuros XB calculation methods were both unable to estimate the peripheral doses in uterus area. TPS showed a dose of 0 mGy at the points that were 13 cm further away from the inferior field edge. On the contrary, TLDs' measurement results revealed that the uterus (fetus) doses were ranging from 77.2–89.9 mGy (mean 84.8 ± 0.4 mGy) for 5-field IMRT treatment plan of the left breast in Alderson anthropomorphic female RANDO radiation therapy phantom. Shielding with a standard radiological lead apron provided a decrease in mean fetal dose by 4.7% for IMRT plan. While dose measurements of unshielded fetus were around 84.8 mGy, they were 80.8 mGy for shielded fetus. All the observed fetal dose measurements are given in [Table 1] according to the shielding (P ≤ 0.008). Dose results of anterior-posterior axis show a decreasing pattern in both cases (89.9-77.2 mGy without shielding and 87.3-74.5 mGy with shielding), as expected. This expectation could be due to the increasing distance from the source and thicker absorbing tissues. Dose results of the right-left axis, however, show an increasing pattern in both cases (82.3–89.6 mGy without shielding and 79.3–86.3 mGy with shielding). 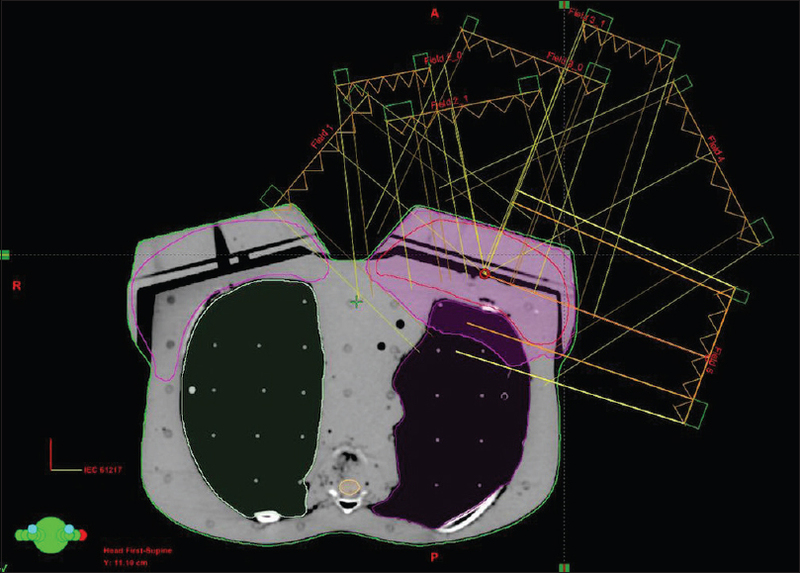 These results are also coherent with the left breast irradiation, as there is relatively less distance and less absorbing tissue between the source (linac head) and measurement points on the left side of the phantom. With the expected rapid increase in breast cancer cases, it would be appropriate to estimate that more breast cancer patients with pregnancy will need radiotherapy. Due to socioeconomical reasons, many of these patients are only able to attend public hospitals that have heavy workload. These centers are mostly lacking extra time and special shielding equipment, thus unable to provide special care to a pregnant patient. In this study, two simple fetal dose-reducing factors were investigated for radiotherapy centers with heavy workload. To estimate fetal doses, photon transfer simulation software could be preferred. Studies which included that software showed that fetal dose could be estimated with higher accuracy when compared with the commercial TPSs; however, these systems are much harder to get familiar with and much more time consuming since they have to be patient specific. Second fetal dose-reducing factor turned out to be a surprise. Shielding of fetus in an IMRT plan with a standard radiological purpose lead apron that has maximum absorption rate around 30 keV proved to be surprisingly useful even in the MV range used in this study. Even a 0.3 mm lead shield resulted in 4.7% reduction in dose to fetus, while causing no discomfort to the pregnant patient. We concluded that in case of higher peripheral doses (i.e., IMRT), even a standard lead apron proves to be a useful tool for shielding in radiotherapy clinics that do not possess any proper shielding equipment. There is another point to be considered; using a lead apron may have a relieving effect on mother by making her feel that her baby is being protected. While it offers a slight protection and no apparent disadvantages, this shielding technique may reduce mother's radiotherapy-induced stress and anxiety that otherwise could cause more serious effects like fetal neurodevelopment disorders or preterm labor. However, patient discomfort with an apron and the possibility of increase in skin dose should also be investigated with further studies to consolidate this method and eliminate any possible disadvantages. Similar studies have been done to protect the fetus during radiotherapy, and fetal doses could be reduced by up to 75%.,, However, these shielding materials, made of 30 cm × 30 cm or 50 cm × 50 cm lead panels with 3–5 cm lead thicknesses, are hard to design, build and use in daily schedule due to their heavy weight, especially in centers with heavy workload. No studies were found which involve lead apron shielding during radiotherapy and for this reason even a slight protection was considered to be important. Most of the recent commercial TPSs are unable to estimate peripheral doses accurately. Although the peripheral doses are very low compared with the target volume doses, they have a critical importance in cases of fetal irradiation. Therefore, using TPSs, a fetal dose-reducing method in IMRT does not seem to be feasible under current circumstances. However, using a standard radiological purpose lead apron seems to be advantageous for its 4.7% fetal radioprotection for IMRT technique when there is no other proper shielding material available in the clinic. International Agency for Research on Cancer. GLOBOCAN 2012: Estimated Cancer Incidence, Mortality and Prevalence Worldwide 2012. Lyon, France: International Agency for Research on Cancer; c2012. Available from: http://www.globocan.iarc.fr/Pages/fact_sheets_cancer.aspx. [Last cited on 2017 Jun 08]. Amant F, Loibl S, Neven P, Van Calsteren K. Breast cancer in pregnancy. Lancet 2012;379:570-9. The International Commission on Radiological Protection. Human carcinogenic risk from intra-uterine radiation. In: Biological Effects after Prenatal Irradiation (Embryo and Fetus), ICRP Report 90. Oxford, UK: Elsevier Ltd.; 2003. p. 176-82. Kennedy EV, Iball GR, Brettle DS. Investigation into the effects of lead shielding for fetal dose reduction in CT pulmonary angiography. Br J Radiol 2007;80:631-8. Islam MK, Saeedi F, Al-Rajhi N. A simplified shielding approach for limiting fetal dose during radiation therapy of pregnant patients. Int J Radiat Oncol Biol Phys 2001;49:1469-73. Hardee ME, Raza S, Becker SJ, Jozsef G, Lymberis SC, Hochman T, et al. Prone hypofractionated whole-breast radiotherapy without a boost to the tumor bed: Comparable toxicity of IMRT versus a 3D conformal technique. Int J Radiat Oncol Biol Phys 2012;82:e415-23. Mori H, Koshida K, Ishigamori O, Matsubara K. Evaluation of the effectiveness of X-ray protective aprons in experimental and practical fields. Radiol Phys Technol 2014;7:158-66. Schover LR. Psychosocial issues associated with cancer in pregnancy. Semin Oncol 2000;27:699-703. Avsar DK, Aygit AC, Benlier E, Top H, Taskinalp O. Anthropometric breast measurement: A study of 385 Turkish female students. Aesthet Surg J 2010;30:44-50. Bradley B, Fleck A, Osei EK. Normalized data for the estimation of fetal radiation dose from radiotherapy of the breast. Br J Radiol 2006;79:818-27. Rosenberg PS, Barker KA, Anderson WF. Estrogen receptor status and the future burden of invasive and in situ breast cancers in the United States. J Natl Cancer Inst 2015;107. pii: djv159. Acun H, Zubaroglu A, Kemikler G, Bozkurt A. A comparative study of the peripheral doses from a linear accelerator with a multileaf collimator system. Radiat Prot Dosimetry 2014;158:299-306. Wiezorek T, Georg D, Schwedas M, Salz H, Wendt TG. Experimental determination of peripheral photon dose components for different IMRT techniques and linear accelerators. Z Med Phys 2009;19:120-8. Angel E, Wellnitz CV, Goodsitt MM, Yaghmai N, DeMarco JJ, Cagnon CH, et al. Radiation dose to the fetus for pregnant patients undergoing multidetector CT imaging: Monte Carlo simulations estimating fetal dose for a range of gestational age and patient size. Radiology 2008;249:220-7. Bilge H. Pregnancy and Radiation. J Turk Soc Obstet Gynecol 2010;7:37-42. Warren-Forward H, Cardew P, Smith B, Clack L, McWhirter K, Johnson S, et al. A comparison of dose savings of lead and lightweight aprons for shielding of 99m-Technetium radiation. Radiat Prot Dosimetry 2007;124:89-96. Dunkel Schetter C, Tanner L. Anxiety, depression and stress in pregnancy: Implications for mothers, children, research, and practice. Curr Opin Psychiatry 2012;25:141-8. Stovall M, Blackwell CR, Cundiff J, Novack DH, Palta JR, Wagner LK, et al. Fetal Dose from Radiotherapy with Photon Beams. AAPM Report No. 50. American Association of Physicists in Medicine and American Institute of Physics; 1995. Buchgeister M, Mondry A, Spillner P, Paulsen F, Belka C, Bamberg M. A special screening for radiotherapy of pregnant women. Strahlenther Onkol 2008;2:80-5. Atarod M, Shokrani P, Pourmogadash A. Design of a generally applicable abdominal shield for reducing fetal dose during radiotherapy of common malignancies in pregnant patients. Iran J Radiat Res 2012;10:151-6.